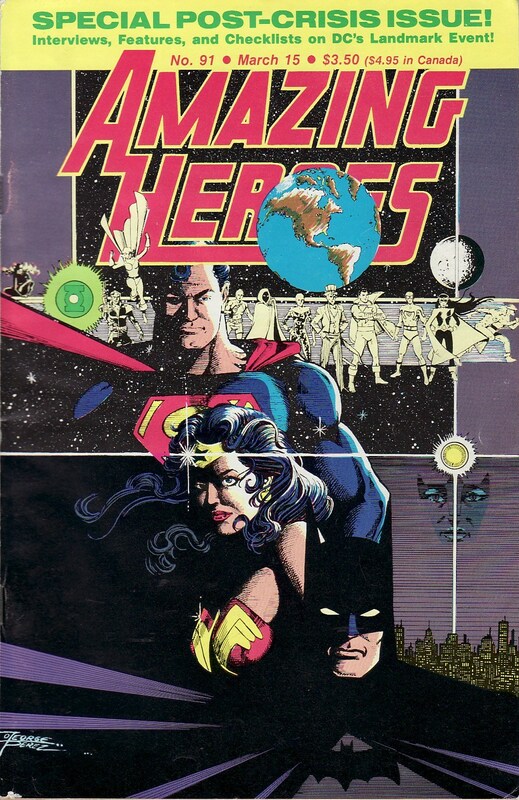 About a month ago I stumbled across Amazing Heroes #91, a treasure trove of information about Crisis on Infinite Earths in retrospect. 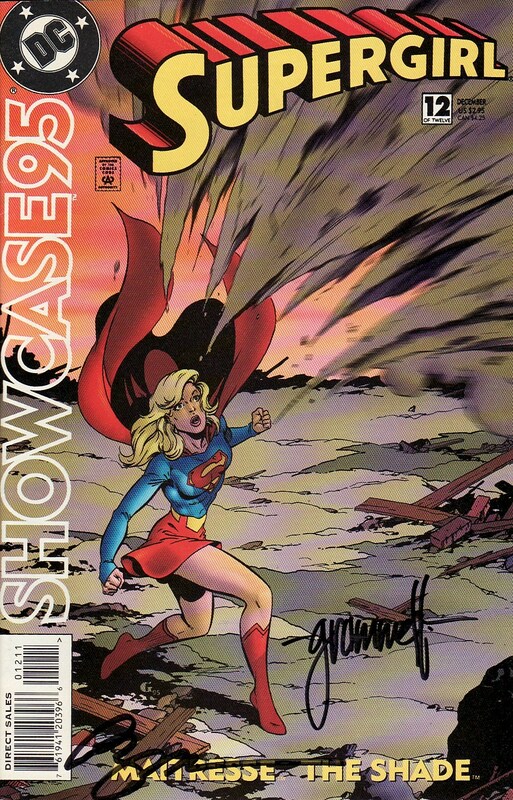 I already covered the look at Supergirl's death scene as being something most everyone - creators and reviewers alike - looked at as having been done well. Now historically, Amazing Heroes wasn't exactly sympathetic to Supergirl's character so I was interested to look more at some of the Supergirl specific commentary in this book. One thing that caught my eye was reviewer R. A. Jones look back at the series in total. Jones does a great job here looking at each issue individually and then summing up his thoughts about that particular section of the tale. For the most part I can remember Jones reviews as being pretty fair and a bit more in-depth than many. 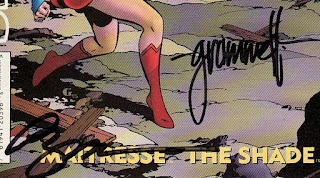 And as a fan of Crisis on Infinite Earths, I dove right in. So what did he have to say about Crisis on Infinite Earths #7? And now onto the super-titles. Supergirl is back on Earth fighting side by side with her family! Fantastic. 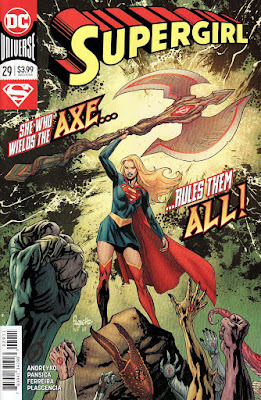 She 'faces her own rage and the corrupting influence of Zaar's axe'! Not so fantastic. I just think Marc Andreyko has little understanding of the character and her recent history. At least it didn't say 'final issue'. 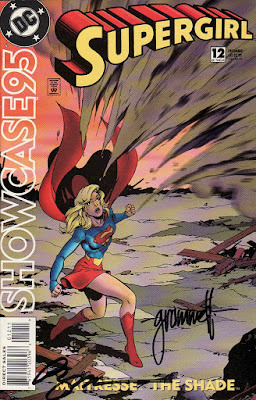 This will be a quick hit but it is hard not to cover a book with art by Amanda Conner which features, albeit briefly, Supergirl. 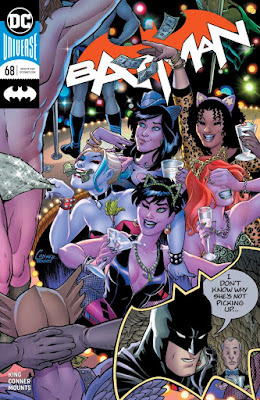 Batman #68 is an interesting issue showing the presumed bachelorette party for the Bruce/Selina wedding. It also again shows the interesting dynamic between Bruce and Clark as they have the most sedate bachelor party I have been privy to. In the end, it looks like this all might in Batman's head as it ends with him hooked up to a mind machine of some sort. So did this happen? 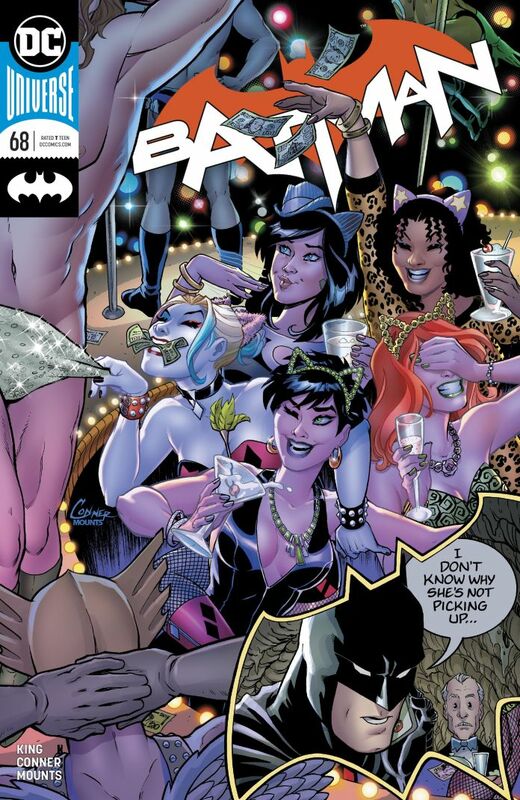 Is this what Bruce thinks would happen at a Selina/Lois party? 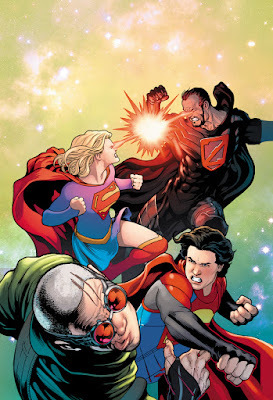 Anyways, much like the double date Batman/Superman issues by King were fantastic, this semi-sequel was just as fun. There are plenty of laugh out loud moments. And it ends with something of a pithy character comment about the World's Finest different views of life. And, no surprise, the artwork by Conner is just incredible. Superman #10 has a cover depicting Superman fighting his father, proclaiming the Wrath of Jor-El. It is a bit of a feint. These two actually never stand in the same room with each other. 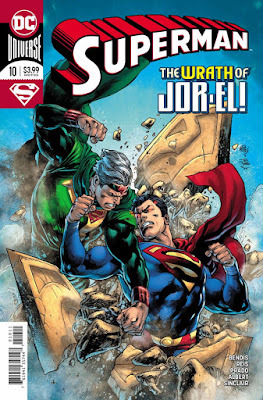 And in some ways, Jor-El is shown in a more positive light than normal (for this book). Still, this chapter of The Unity Saga, written by Brian Michael Bendis with art by Ivan Reis/Joe Prado (present day) and Brandon Peterson (flashback sequences) pushes the plot forward nicely. There are some very good moments in the book and one nice hint at future battles to come. I don't think I will ever be happy with the aging of Jon. I don't like the idea that he spent years marooned on Earth 3, either trapped on a volcano or in hiding. I don't think we needed that to happen. But, at the very least, he didn't go grim, dark, or evil ... my biggest worry when I first heard this was occurring. I don't think he should have gone; I don't think he should have been allowed to go. I don't think Lois should have left him. But here we are. Bendis as usual brings us some great character moments. I like how Jon is thinking of Damian almost immediately on his return to Earth. And the Clark/Lois/Superman relationship still hasn't been explained well enough for me to understand what the heck is going on. At the very least, we know they are still madly in love with each other. As for the art, it continues to impress. Peterson brings a sort of organic feel to his stuff with round edges and minimal rendering. Reis and Prado continue to evoke a sort of Neal Adams grandeur to the proceedings. Overall, this was a very good issue. On to the details. The new DC Superhero Girls series has really hit the ground running. Mixing in 'full' episodes over on Cartoon Network and shorts over on YouTube, Lauren Faust and crew have been giving us all the material we need to learn about the new takes on the characters and their environment. Now I will admit, this is an interesting take on Supergirl. She is brash. She is rough around the edges. Here she is downright duplicitous as she takes advantage of a friend's kindness. This isn't the kind, dorky, awkward Shea Fontana Supergirl. But she is very likeable as a sort of 'bad girl' for this group, albeit one with a soft interior that occasionally gets shown. I have been loving this series from the beginning and already know I need to cover the Cheetah main episode. So there will be more coverage soon!